Let me start with this: we are popcorn enthusiasts here at the Skunkboy house. There was a long period of time where we were having popcorn AT LEAST once a day... sometimes twice. Hey, when someone (Johnny) buys you something you've always wanted (popcorn machine), you maaaaay go a little overboard with it for a while. ;) What can I say? I'm easy to please. I've wanted one of those darling and functional bar carts for some time now, but two things have kept me from having one: A) we don't really ever make cocktails at home, so what's the point? and B) I would be too nervous about my adventurous little 2 year old doll-baby getting into it. Not worth it. After fighting with finding a smart place for our fun popcorn machine, it finally struck me. Duh: popcorn cart. 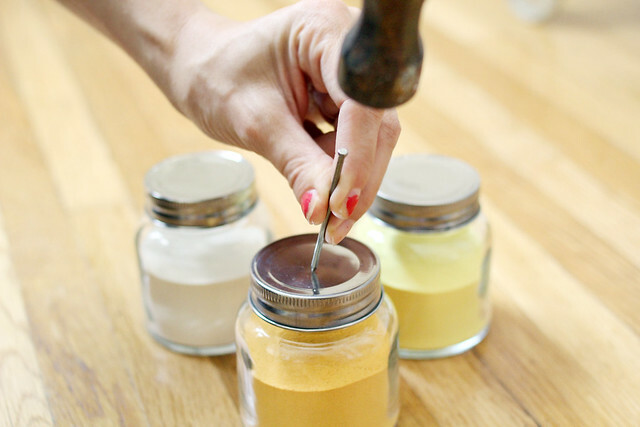 I couldn't find any shakers that I was happy with, so I found these little canisters and decided to DIY them. 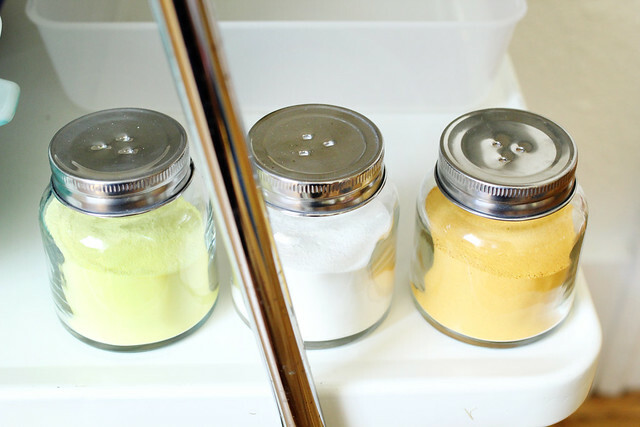 I used a hammer and a nail to punch the holes, and the result is way cuter than those brightly colored plastic containers that typically house the popcorn flavor powders. I was going to label them, but it's pretty self-explanatory: yellow- butter, white- white cheddar, orange- nacho cheese. 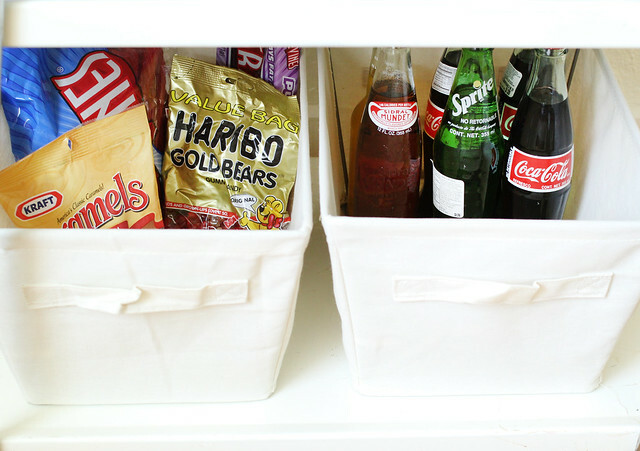 Adding soda and candy to the cart makes it perfect for impromptu movie nights! We love having all of our supplies in one place now, instead of running all over the kitchen and the pantry to gather everything. Now it's time for a popcorn party! Thanks for sharing. This is such a lovely project. CUTE! Love it! You guys always have the most fun things in your home! I need something like this in my life, I'm always running last minute for impromptu movie supplies. I've felt the same way about a bar cart. So cute but 1) littles knocking it over and 2) we're not big drinkers. But this is brilliant! I love that you've added other movie snacks to this set up. It's just too perfect. Ok, I officially need a popcorn cart. This is awesome! I love this! I'd definitely use a popcorn cart more than a cocktail cart... I'm more of a snacker than a drinker. :P Movie nights would be so much more fun. I make popcorn all the time too but my popcorn maker isn't half as cool looking as yours. 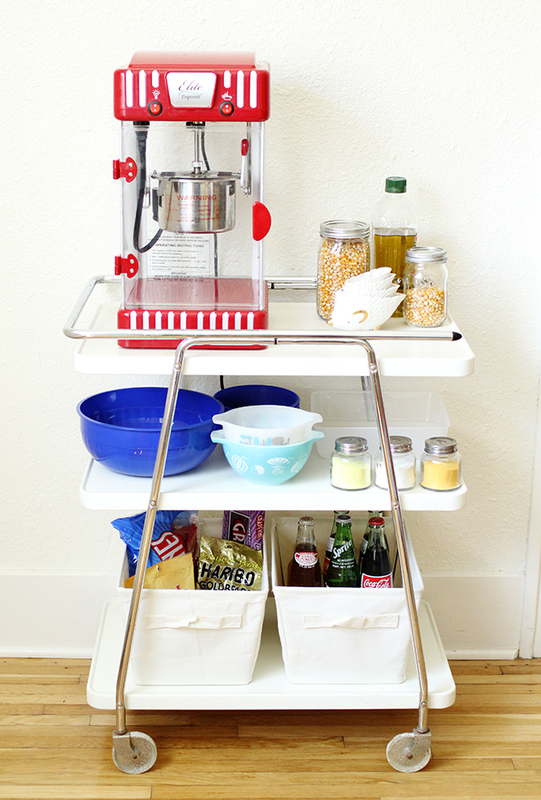 I love this movie cart idea with the soda and candy stored below. I'm totally going to have to do this someday! love it!! looks like a lot of fun. I want one!! 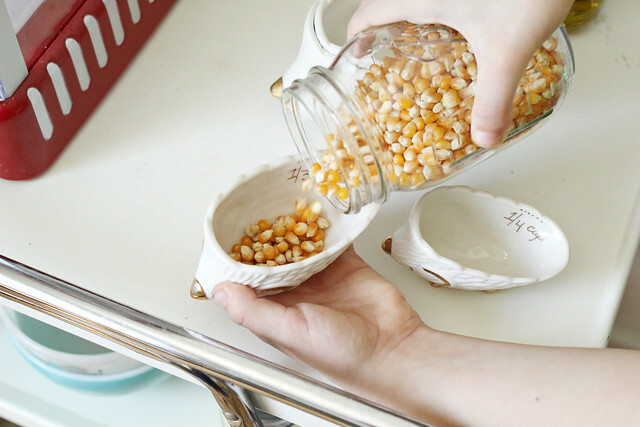 Do you ever make sweet popcorn? I love popcorn too. I swear if I smell it anywhere I float like a cartoon character towards it. I have one of those old carts. Mine was always used for junk. I think I need a better use for it like your snack station. Yes! Now that is my kind of a bar cart. I love it. I am obsessed with popcorn as well, but can only dream of a popcorn machine for myself, let alone a whole popcorn cart. That looks like your in for some serious pop corn eating! Love it! What a cute idea for a cart! We us ours for coffee and tea. My roommate and I are both baristas at a coffee shop so it just makes since. I love popcorn too but my boyfriend hates it! I will never understand. Too cute! 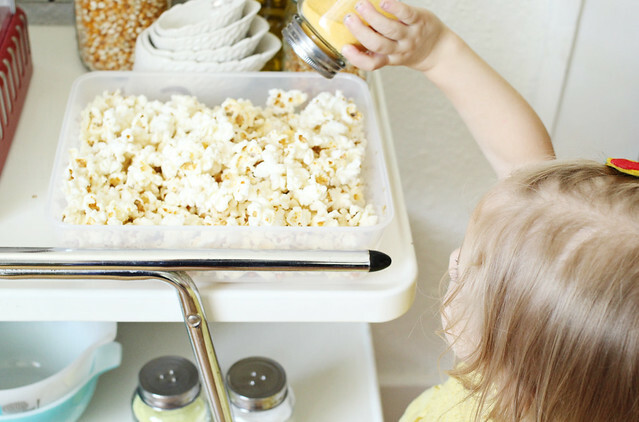 We love to make popcorn at home too. I love it made with organic canola oil, then topped with nutritional yeast. Yum. GENIUS!! We are popcorn lovers over here too. I have a "bar" area that never gets used... Now I want a POPCORN CART!! this is darling - and yummy! This is absolutely adooooorable!!! I love the DIY toppings (in my dream world where I also have a popcorn cart, I'd maybe add some things like rosemary or cinnamon sugar, too! ), and making it into a fully-stocked movie night cart is brilliant! Love the soda in glass bottles, too. Loooove. This is wonderful! I am a huge popcorn lover. What a cute setup! I love this family friendly version. I've been looking for a cart like that forever. This would be great for sleep overs. Which we have lots of at my house. This is THE sweetest idea ever in life. You and your family are seriously the cutest. 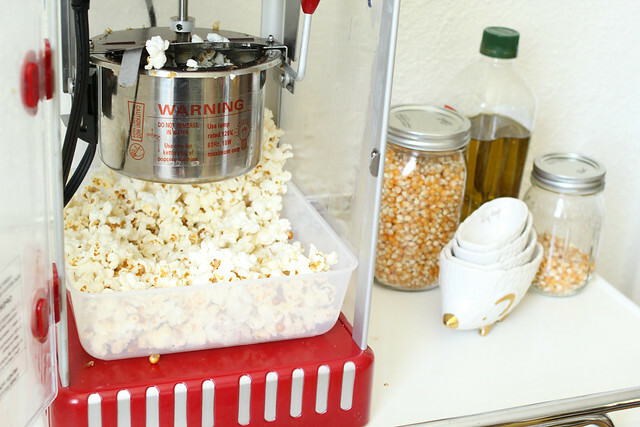 i have a hot air popcorn maker and use it way too less because it is stored in the back of my pantry. a popcorn cart sounds like just the thing i need. The popcorn cart is so amazing! What a great idea! ARE YOU FREAKING KIDDING ME?!?! I love popcorn. I'm not kidding. I have an addiction. And I totally want a popcorn cart. It's on my list and has been for years. This is so cool and amazing and I'm so jealous. Side note-have you ever tried it with coconut oil?? It's soooo good. And I'm not a coconut fan. But it's good with popcorn instead of olive oil, canola, etc. The perfect installation for a family movie night, I love it! What a great idea! It means more movie nights at home with family and friends. Just sent my boyfriend the link for the popcorn maker. Looks like exactly what we are looking for. You really love it do you? Cute pictures are per usual my dear! oh so perfect! in my old job we used to have popcorn all the time. it was like a ritual! yum! Genius. This is such a great idea! I love how you've done something unconventional with something so ordinary and tailored it to you and your family's needs. This is so convenient when it comes to prep time and spontaneity. Love it! Yesssssssss. Okay, you don't have to KEEP asking Katie! We'll come over. Oh my god. so perfect. i love popcorns, always. i am used to buying microwavable popcorns in supermarkets whenever I do my grocery. And when you showed that popcorn things, i was like, i want to have it too. Yay! it is so perfect for slumber/movie nights parties with friends. thanks for sharing, that gave me an idea! 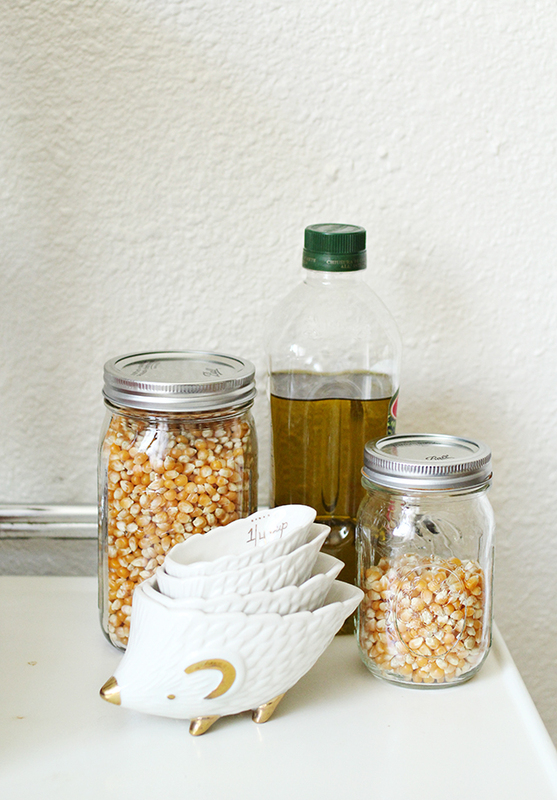 Love this idea - I have been trying to figure out a way to display our popcorn machine! Might try and find a cart. Love the shape of yours! I love your idea Katie! We are big movie night fans at our home. I can never find bottled sprite (maybe because I am not a good finder), where did you find yours. LOVE IT LOVE IT LOVE IT! This is such a fun idea! I love it. My sister and I would often go on movie and tv marathons. This'll be perfect! Whoah, this is so much better than a liquor/cocktail cart, young children or not! I love all the added extras. This is awesome. love this! my girls (aka - my two dogs, Polly and Ella )and i eat popcorn almost every night! We used to just pop it in the microwave, but since we have been going to this great little whole foods market that sells organic popping corn, we made the switch to popping ourselves. 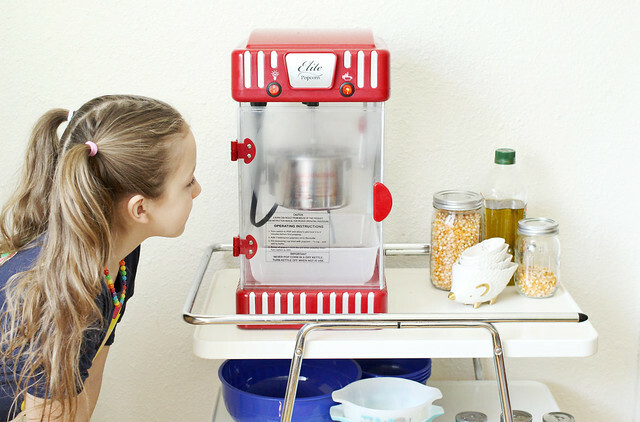 we have currently borrowed a popcorn machine from my parents - but i have always wanted one of those adorable machines that you have (we have a movie theater set up in my house, 110" screen and projector to watch movies! )i might have to save up and get one of those machines and have a cart too - because it's just so awesome! Love this idea! I've been toying with making a coffee/hot chocolate/liquor cart for awhile... might be time to focus on popcorn, instead! One question--where did you get the cart itself? I've been looking everywhere for something cute and oh-so cheap, and I'm having a tough time finding something! I had that exact same cart in a "before" state, down to the glitter wheels and all. Unfortunately my boyfriend was not a fan and after six months it was put on the curb, gone in five minutes. Loved it!